Laura Bucci, one of our Got Craft vendors, will be teaching a mini art button making workshop at the ArtWay Art Studio in Vancouver. Workshops will encourage participants to explore their creative side using collage, rubber stamping, drawering, painting and fabric. 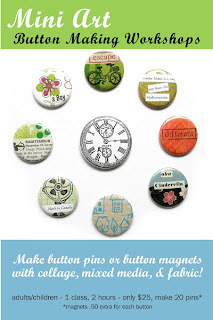 Each participant will take home with them 20 1.5 inch pins and / or magnets (small additional charge). Classes will be offered on a monthly basis starting on July 14th and are open to both adults and children between 8 to 12 years of age. Space is limited, so visit this website to register online. 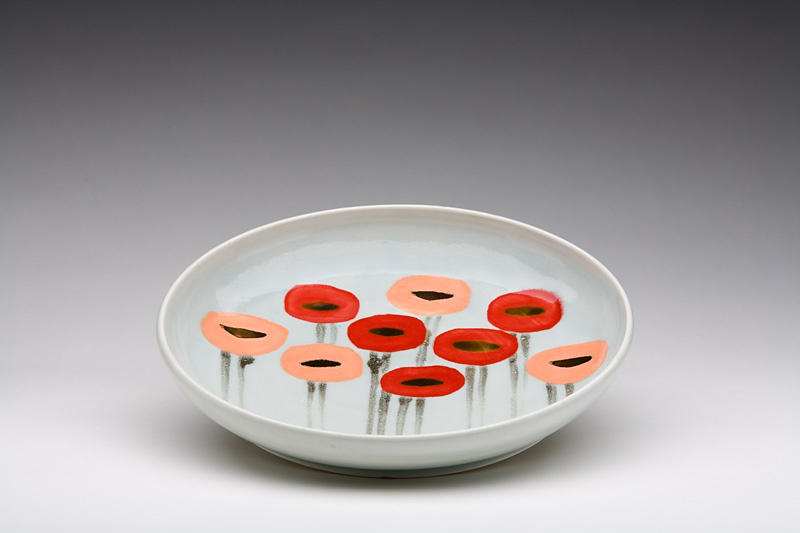 Laura Bucci is a Vancouver-based artist designing and making cup cozies, wall art, tote bags and more. but teaching you some new vocabulary along the way. She is an Italian-Canadian and draws inspiration from her love of culture, language and imagery to create image/text compositions in various languages. You can view more of her work in her shop or her blog. We were in Portland two weeks ago with Miranda for the Summit of Awesome (more on that later) and kept driving past this studio space. With some afternoon free time, we pulled over and went to discover what this place was all about! Modern Domestic is a new sewing / crafting studio and retail space in Portland by the lovely people from Bolt Boutique. They offer classes in sewing, felting, silk-screening and surface design classes for all skill levels including kids and teens. 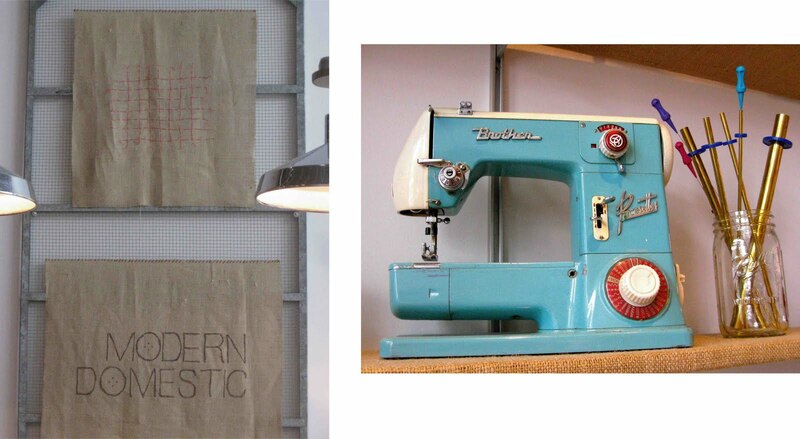 Modern Domestic is a loft style, open studio equipped with sewing machines for teaching on both floors. If you have some unfinished projects, but don't have your own sewing machine, machines and tools are available for $8/hr US or pre-pay rate of $50/10 hours. They are also an authorized sales location for Bernina and Janome sewing machines and a service drop off point for all other major machine brands for when your machine needs a good clean or tune up. Here are a few tips and tricks for maintaining a happy machine from Modern Domestic! Do not blow into or use canned air to clean out your machine. Lint flies up and may damage the computer boards. Also, the air can cause condensation in the machine and create problems with rust. If you have a computerized machine, be sure to not set a magnetic pincushion ON your machine. Setting one next to your machine is safe. Oil your machine ever 12 hours of sewing. To oil, squeeze 2-3 drops of machine oil onto a Q-tip and gently rub the hook race. Run the machine first to prevent oil from soiling your work. I am back and I have plenty to share with you. Sorry for the random posts and for being MIA (missing in action) the past few weeks. Life and "real" work has been crazy now that wedding season has fully hit plus our summer events just wrapped up last weekend and my first nephew just arrived late last night! When I first started my blog in 2007, I had no concrete plans on where it was going. It was a meeting point to talk about upcoming events, life, travels... I really didn't think that people other than my mom would actually read it! In the past two years, traffic started picking up and readers started introducing ourselves. For our lotus events blog, we had brides to be that would tell us they read our blog before they were engaged. Which was both wierd and cool! Want to be a guest writer? Have a fantastic idea that you want to share with us? Leave a comment and watch this space grow! 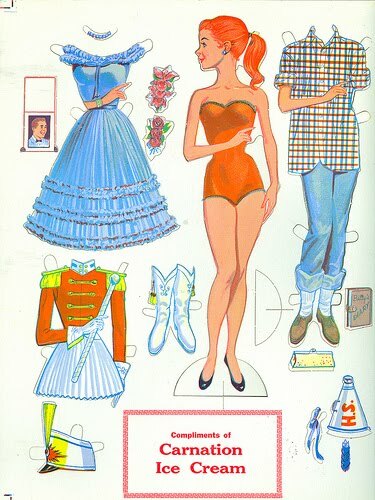 A friendly reminder that today is Swap-O-Rama-Rama Vancouver! Swap-O-Rama-Rama is a clothing and craft supply swap in which a community explores reuse and creativity through the recycling of used clothing. A series of DIY stations will be on-hand to unleash your creativity including screen printing by Blim and sewing stations by Plush On Main. Take as little or as much as you like! All remainders will be donated to Big Brothers of Vancouver. $6.00 at the door plus a bag of clean clothes and / or a bag of craft supplies to swap. Known for their great style sense, Eugene Choo will be holding an outdoor market once a month through the summer. Market at Eugene Choo will feature a selection of their favourite designers such as Collage Collage, Daughters of Dawn Vintage and Banquet Design plus vintage dealers and food vendors! So what if we were just in Portland!? The Summit of Awesome is taking place June 16th to 18th at Kennedy School in Portland! When it comes down to Portland plus mind blowing crafters that are congregating in one place for 3 days of awesome, well... I really couldn't say no. Plus, we have road trip buddies this time! That's right. Road trip buddies that have never been to Portland before. I know right!? *gasp* Oh... the plans filled with thrifting and eating have already started! Back to the Summit of Awesome though... I blogged about it earlier when I first read about it. I hummed and hawed about it for awhile then with some (very to non-existent) arm twisting by Kim and Robert, I said "Ok, I'm in!". So I went online and checked to see what this summit was all about. So what is the Summit of Awesome? 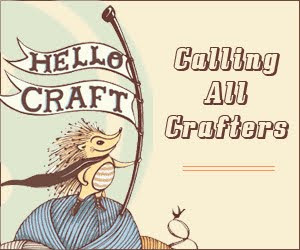 Hello Craft is a non-profit trade association dedicated to the advancement of independent crafters and the handmade movement, as well as empowering small business owners and educating the public to the benefits of buying handmade. They actively pursue their mission through various events such as the annual 3-day conference, the Summit of Awesome. Well, sessions include "How to develop a press packet", "Brick and Morter: how to run a brick & mortar shop", "Monetizing your website and online advertising basics", "Wholesaling", "How to pitch a magazine or blog" and the all important "Copyright and Trademark". Passes for all 3 days can be purchased here. If this wasn't enough, meals are included on some days and there are plenty of crafty activities to keep you on the go for your entire stay. Starts this Wednesday, so get your passes now! Hope to see you there! 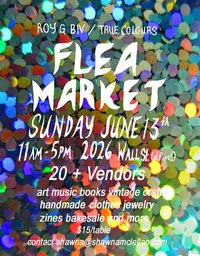 Roy G Biv and True Colours host a one day flea market including lots of finds such as handmade clothes, crafts, jewelry, records, zines, books and homemade baked goods to name a few of the crazy items you can find here. To celebrate the 50th anniversary of Olympus' PEN camera, they created a stop motion tribute called 'the PEN story'. The video includes 60,000 unique photos, 9,600 prints and 1,800 pictures were shot again with no post production. Locally based, the Craft Caravan provides monthly kids craft activities for families that are looking for things that challenge young hands and minds. Like many parents with small children, the creators of Craft Caravan decided to help parents like them who were always scrambling for craft ideas and supplies to entertain their kids. "We make craft time simple and fun, and that's exactly what busy families need." All crafts are adult designed and then run through by their official 'testing crew' - the Craft Caravan's 7yr old daughter and 5 yr old son. "We know that if a craft gets their seal of approval, your preschoolers will love it!" Club packages arrive every month, just like a magazine subscription. They have various packages available including pay as you go, yearly, every 3 months or a monthly trial. Once you have chosen a package, your kids will start receiving craft supplies addressed to them. > A bright green envelope for delivery - great for re-use in any craft project! Packages are shipped at the beginning of each month and can be expected to arrive in your regular mail within the first two weeks of the month. All you need to do is provide some glue, a clear workspace and your time. Yay for spreading crafty joy! 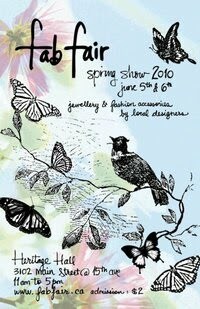 Fab Fair is a jewellery and fashion accessories from 50 local designers. 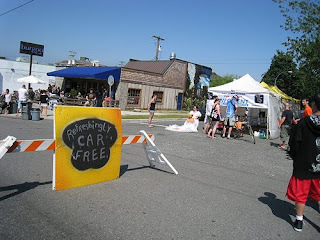 Concieved 7 years ago as a response to a craft fair the organizer was helping jury where 50 jewellery designers vied for 5 spots in a Christmas craft fair. An annual cash scholarship will also be awarded to a jewellery student at VCC's Jewellery Art and Design program. The winner will have an opportunity to show their work at the Winter event. Have you checked out the block of East. 15th Avenue between Kingsway and Fraser Street lately? If not, you really need to head over there! 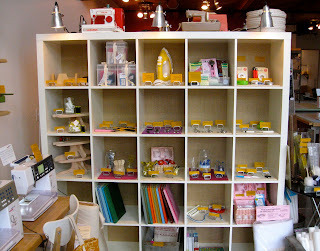 Awesome shops such as Collage Collage, RubyDog's Art House and Les Faux Bourgeois have called this strip of Vancouver home for almost a year and now, they are joined by a new kid on the block, Spool of Thread Sewing Lounge. 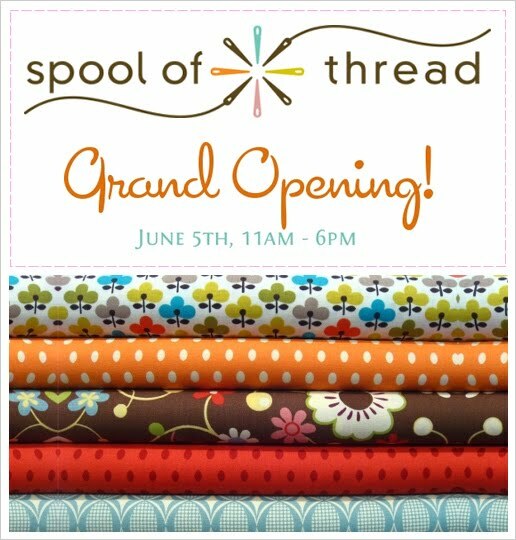 Spool of Thread is Vancouver's first sewing lounge! What is a Sewing Lounge, you ask? 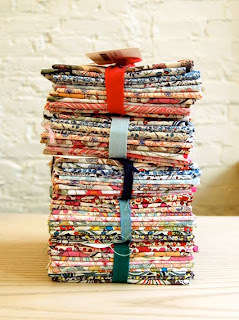 Well, in the words of owner Lili and Henry: Spool of Thread is a modern twist on making. 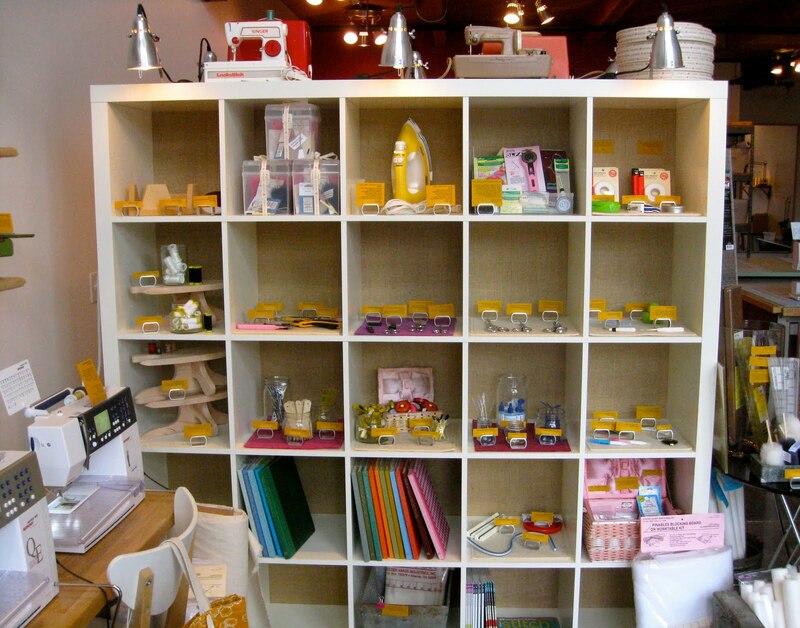 Our retail store will provide the tools and the space you need to create your next sewing project. We will also have a wide selection of unique and hard to find fabrics. 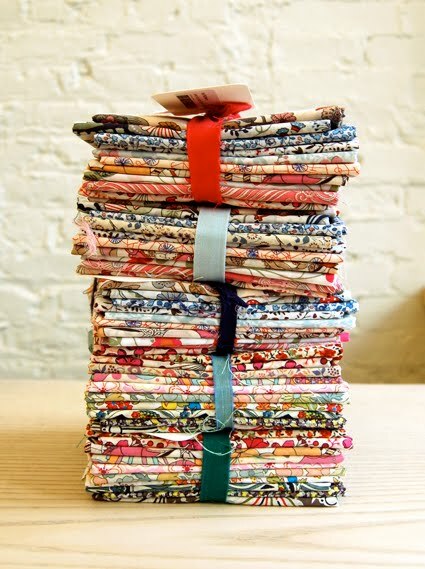 Our store will have sewing machines available for pay-by-the-hour rental during our store hours. Along with the sewing machines, sewers will have access to large cutting tables, irons, dress forms and other sewing accessories. 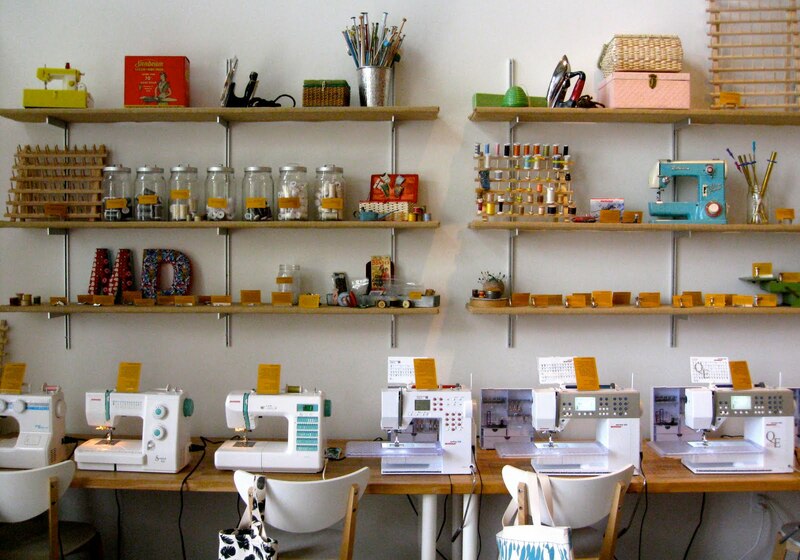 The store’s Sewing Lounge will also be used for sewing workshops and classes with instruction from crafters and sewing experts. Want to keep up to date on all the news including upcoming workshops? Subscribe to their newsletter by visiting their website or follow them on twitter at @SpoolofThread! 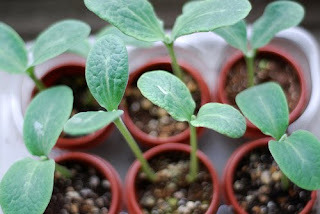 You can also check out images from their DIY table at Got Craft last May! Robert and I took the Mighty Ugly challenge last month and now you can too! Unleash your inner ugly and take this creativity workshop to free your mind and get your craft on. $35.00 per person. Spaces are limited. Call 604.708.5199 or barbara@plushonmain.com to register. Supplies and tools included. Come create a hideous creature! You'll use your brain and your creativity in shiny new ways, while chatting with others and getting your craft on (no crafts experience necessary). Already booked on that day? 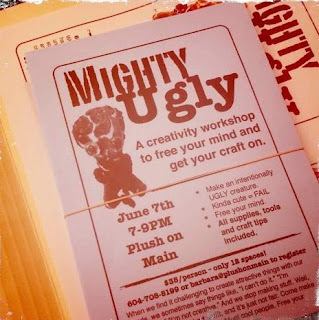 Sign up for the Mighty Ugly newsletter to stay informed!